No one has to teach us how to be self-centered, we are born that way. If you have been around children, you know what it’s like to witness selfishness first hand. Children argue over books and toys. They say things like “Me first, I want that, give it to me”. When there’s only 1 brownie left, they want the biggest half. You know, I’ve also seen selfishness in adults too—especially in myself. There are times when I can be just as selfish as a small child. I rush into a restaurant so I can get in line first, I want the closest parking space, the shortest line at the grocery store and I don’t just want the biggest half of the last brownie—I want the whole thing! Can you relate? Listen to this verse found in the book of Philippians, “With humility of mind, let each of you regard one another as more important than himself” Would you agree that most of us do not live this way? It’s a struggle for us to regard other people as more important. It seems as if we are wired to look out for our own personal interests instead of the interests of others.” As if our time is more valuable than someone else’s time. But, as followers of Christ, our lives should speak self-less-ness. This verse in Philippians tells us to have humility of mind. This means that within the private life of our thoughts, we should think of others above ourselves. Reminding ourselves of who are called to be in Christ—humble. This will change our lives for the better. It will create in us a selfless spirit and it will please God. Maybe you too struggle with being selfish. I encourage you to ask God to give you a spirit of self-LESS-ness. Ask Him to help you be live out this verse. 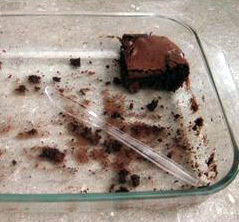 And the next time there’s only one brownie left, put someone else above yourself and take the smallest half. Thanks for always posting right when I need it. I have felt so selfish lately and have really tried to remember this verse.